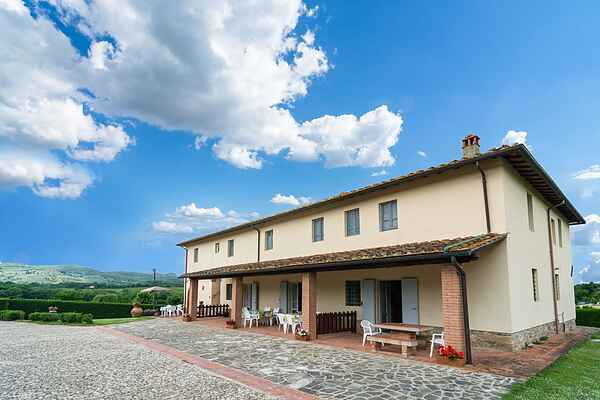 In the heart of Tuscany, between the famous cities of Siena, Florence and Arezzo is located this typical authentic farmhouse with a total of five apartments. Apartment Il Coppo is located in the white house. The decor is typical rustic Tuscan style. The apartment has a private terrace at the front of the property overlooking the tennis court and swimming pool. On the other side of the house is a terrace overlooking a small hamlet and the surrounding area. Also on this side of the house is a private terrace with more privacy and a spacious garden. This well maintained farmhouse is an ideal place for a relaxing holiday with family or friends. The agriturismo is located in the Tuscan hills, surrounded by nature with views of the green Valdambra. The environment consists of sunflower fields, olive groves and farmland. There is a covered parking, a tennis court, bocce court, a swimming pool and a covered terrace with tables, table tennis and playground equipment. The house owner can provide information about the area! In the beautiful surroundings you can undertake many excursions. For example, go to Civitella in Val di Chiana for a nice walk in this small hamlet. In the bar you can have a delicious espresso and you have beautiful views over the valley. In the hamlet are various art works.